Are you curious about how The Junior League evolved into the century-old global movement that has had such a profound effect on modern life? So are we! That’s why we’ve opened up our archives and brought our legacy to life in this easy-to-use interactive timeline. In this multimedia presentation we have curated what we believe is a fascinating look into the history of one of the planet’s most powerful women’s organizations. 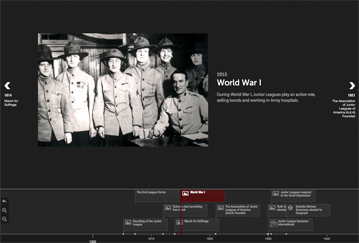 The timeline is dynamic, so you can look forward to regular updates and additions of new archival materials. This timeline would not have been possible without the generous contributions of our partners, the National Women’s History Museum and the National Women’s Hall of Fame. Honoring great women of yesterday and today, while shaping the leaders of tomorrow. The Museum researches, collects and exhibits the contributions women have made to the social, cultural, economic and political life of our nation in a context of world history.